Between 1997 and 2001, a unique phenomenon took place, related to the emerging World Wide Web. Investors all over the world set off on a veritable gold rush, snapping up shares of practically any company whose name started with "e-" or ended with “.com”, and driving their price sky high. The bubble burst after a bout of dizzying speculative growth on the stock exchange: the stock price of numerous digital-technology companies, including some emblematic cyberspace pioneers, fell through the floor. In spite of that unmistakable lesson about what comes from arrogance in business, which has gone down in history as the dot-com bubble, businesspeople’s ambition didn’t wane, and the dreams of making a quick killing with opportunistic hunches and half-baked ideas only grew. In spite of this fiasco, one of the companies that proved to be fundamental for the transition to a more stable digital economy was PayPal, a more secure and efficient system for charging and sending money. In 2000, Confinity, a software company that worked on payment transfers, merged with the online bank X.com, created just one year before by an extremely astute and ambitious Canadian-South African by the name of Elon Musk. The next year, the new company adopted the name PayPal and immediately started growing and expanding until it became the gold standard for money transfers online and within the system by which over 70 percent of eBay purchases were made. Consequently, in June 2002 the popular auction site paid 1.5 billion dollars for it. This was the perfect example of how empires and gigantic fortunes were created in the blink of an eye in an emerging, confusing economy. Musk took home roughly 180 million from the deal, enough to retire comfortably, or else invest in dozens of ideas with the potential to generate enormous profits. However, he took a tougher road, following fantasies from his childhood and dreams of transforming and saving the world. This is unusual in a time when most software developers devote their talent and energy to the search for the definitive killer app. Elon Musk (left) with his siblings Kimbal and Tosca. Musk was born 45 years ago in Pretoria, the son of a South African engineer and a Canadian model. From a very young age he spent whole days reading (the story goes that after burning through the books in the local public library, he read the entire Encyclopaedia Britannica). When he was 12, he designed the videogame Blaster and sold it for 500 dollars. At 17 he left South Africa, when the apartheid regime was still in place, at least in part to avoid service in a “fascist army,” and he went to Canada to study. He later traveled to the United States to continue his studies in Economics and Physics at the University of Pennsylvania. Then he earned a master’s degree at Wharton. With his brother he founded the media service company Zip2, which he sold to Compaq in 1999 for 307 million dollars, of which 22 million were his. He married the fantasy-book writer Justine Wilson, and in May 2002 his first child was born, but died tragically the following July, the victim of sudden crib death syndrome. In 2004 Musk and Wilson had twins, and in 2006, triplets. During the final decades of the 20th century, space travel came to be seen more and more as a pointless endeavor, and lobbying to revive the space program was dismissed as a waste of money and a somewhat naïve, nostalgic obsession. Musk, however, believed not only that it was time to launch new cosmic missions, but that it would eventually be necessary to think of establishing extraterrestrial colonies. When he declared that it didn’t seem to him a bad ida to die on Mars –as long as it wasn’t on impact during landing—many people though he had come unhinged or else was plying a sly joke on the world. Musk believes there are two main reasons for space travel: first, as a life insurance policy should the Earth become uninhabitable and the human race need to become a multi-planetary species, and second –the reason he prefers—because it would be humanity’s greatest adventure, and he wants to go along for the ride, as inventor, investor, builder, and when the time comes, pioneer. In 2002, Musk launched SpaceX, a company committed to bringing space exploration and conquest up to date with money, research and private initiatives. At the beginning he tried to buy a Russian intercontinental missile; after intense but futile negotiations, however, he realized that the prices of that technology were artificially inflated, so he decided to make use his own low-cost rockets. He read up, gathered information, and designed the whole system, from the motor and fuselage to the launching pad, the control tower and the aeronautics software, with the aim of setting up regular space travel service that would work like an commercial airline, serving companies, individuals and government agencies. His first launch, in March 2006, ended with the rocket crashed on the ground in less than a minute. Two years later, the Falcon I was the first privately-built rocket to reach orbit, and in 2012, the capsule Dragon was the first commercial vehicle to succeed in berthing at the International Space Station (ISS). Last September 1, the Falcon 9 blew up before its launch from Cape Canaveral, Florida; the rocket was to transport a communications satellite from Spacecom, an Israeli company that counts Facebook among its customers. 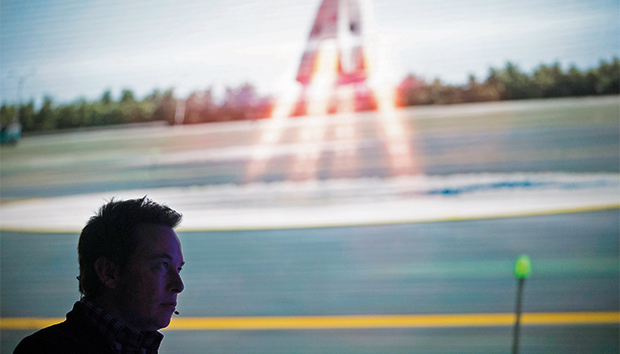 Musk could see clearly that for his space adventures to have a future, not only would they have to be commercially competitive, they would have to stimulate the imagination as well. One the one hand, he has managed to bring down the costs of a mission to the ISS from a billion dollars to just sixty thousand; on the other, he wants to develop the most powerful rocket in history, the Falcon Heavy, and he has devoted his time to promoting the idea of a massive colonization of Mars. It is important to point out that other digital-economy entrepreneurs have also gone into the space-conquest business and spacecraft design, such as Jeff Bezos, founder and director of Amazon, and John Carmack, the celebrated designer of video games such as Doom, Wolfenstein 3D and Quake. Musk does not consider Richard Branson, with his company Virgin Galactic, as a serious competitor in the space race: he sees him as someone who wants to offer his customers “a suborbital thrill ride lasting a few minutes.” And although Bezos and Carmack undeniably have the talent, resources and passion to venture down the same road, they cannot match Musk’s tireless dedication and almost manic zeal. In 2004 Musk joined the board of directors of Tesla Motors, founded by Martin Eberhard and Marc Tarpenning, and he started financing the production of electric cars. This was a another brilliant idea that had brought many entrepreneurs to their knees in the past, and the experts insisted it was a pipe dream, at least as long as Big Oil had the power to block the commercialization of cars that used alternative energy. Musk, like Ford in his time, has always maintained that the company’s strategic goal is to produce electric cars for the mass market. Until Tesla came along, electric cars were a curiosity, unpopular and with limited scope. Tesla has built surprising luxury cars—comfortable, stable, extremely fast (the S model can accelerate from 0 to 100 km per hour in five seconds) and at a price that is bound to keep dropping (its most economical family model will cost about 32 thousand dollars, while the top models cost over a hundred thousand dollars). Musk has also bought the solar energy company SolarCity Corp. and plans to create a network of supercharging stations to ensure that his cars can circulate in cities and on highways without the fear of running out of power. Musk has no shortage of extraordinarily ambitious forecasts and promises, like his statement that in August 2016 he would increase the weekly production of cars by 50 percent over the first half of the year. While he could not make good on that promise, Tesla has moved on from being an exotic car company and become a fierce competitor in the auto industry, valued at 34 billion dollars, with breakneck growth that is leaving Ford and General Motors behind. The price of the company’s stock, of which Musk is the primary owner, has increased by over 760 percent in the last five years. Last July, Musk published Tesla’s “mater plan,” in which he announced the upcoming production of pick-up trucks, heavy-duty trucks, buses and other vehicles that will ply the world’s highways; his goal is to produce a million vehicles a year by the end of 2020. Aside from the fact that Tesla cars already compete favorably against the best and most efficient gasoline-powered cars in just about every parameter, the company is also pioneering self-driving vehicles. An update of the software of the automatic pilot will allow cars to accelerate, stay in their lane or change lanes, and even park without any input from the driver. Obviously, the accident that happened on May 7, 2016, in which Joshua Brown became the first person to die in a self-driven Tesla, was a tough blow to the company and a serious setback for this technology. But it is hard to rebut the fact that cars driven by people are far more lethal weapons than cars on automatic pilot. Apparently the sensors on Brown’s car misinterpreted the side of a white tractor-trailer thinking it was the sky, and neither the car nor the driver braked in time. In the fateful year of 2008, while the planet-wide financial crisis was wiping out companies and fortunes, Musk got divorced and the production of his flagship Roadster model car was sidetracked by a series of problems. That year, three of his rocket launches ended in fiery crashes – the last one destroyed the cargo, including four satellites, one from NASA—. With the risk of bankruptcy on his back, for both SpaceX and Tesla, Musk’s future hung on his fourth launch, which he financed with all the money he had left. The rocket took off flawlessly, and that feat landed him a contract with the space agency worth 1.2 billion dollars for 12 trips. In December of that year he cobbled together last-minute financing to save Tesla from collapse. In 2010 he remarried, but his new wife, Talulah Riley, in a few short years lost patience with marriage to a hyper-driven businessman with five sons. In 2012 they divorced, but the next year they got married again. Musk’s imaginary is full of references, nightmares, promises and epic tales inspired by his voracious reading, which includes science and science fiction. On the one hand, he acknowledges that the series of Isaac Asimov novels Foundation, is one source of inspiration. On the other, he is one of a handful of scientists, academics and businesspeople (along with Stephen Hawking and Steve Wozniak) who are concerned about the runaway development of artificial intelligence and its possible repercussions. The most provocative element of his vision might be the way he reimagines the use and acquisition of energy in order to move toward the total transformation of the planet’s energy infrastructure. This has been a dream of many an idealist and environmentalist, but Musk seems to be on the trail of a mechanism that will actually do it, a technology that is not only possible but also desirable. Musk has often spoken of the need to stop, or at least slow down, global warming. But in the event of failure, the Earth will turn into an uninhabitable inferno, and the alternative that Musk proposes is to escape to space colonies on another planet on board his rockets. His goal is not limited to exploration or the occasional space tour; it aims to “develop the technology to transport large numbers of people, plus cargo, to Mars,” as he stated in an interview with The Guardian (17-7-2013). In other words, he is interested in moving whole communities, entire cities, and while he does not feel there is a big rush, he is convinced that the threat is real and imminent. Sketches of the Hyperloop, a high-speed transportation system designed by Elon Musk. Oddly enough, this man, who was the inspiration for the Iron Man character in the movies and who wants to save humanity, or at least part of it, has a reputation for being an absolutely tyrannical boss, even cruel, who treats his subordinates with disdain, has zero tolerance for mistakes, and feels no obligation to reward even the extreme loyalty of his most dedicated workers. Musk is an egomaniac with very little empathy, stunted social skills and even less generosity. Many criticize him for never having invented anything himself, but rather repurposing other people’s inventions (similar complaints were made about Steve Jobs). But it is frankly beside the point to focus on that aspect of the man when his achievements, and the motivation he has generated among other inventors and venure capitalists, are nothing short of colossal. Musk is, in a certain sense, a product of Silicon Valley, but at the same time he is a dissident within that entrepreneurial world. He has engaged in more than a few shouting matches by criticizing the beliefs and practices of other magnates of the digital economy. He has said that engineering is the closest thing to magic and has intends to use it to start a cultural and technological revolution. The computer pioneers, armed with generic electronic parts, machine language and a vague idea of the practical uses they could give to their rudimentary personal computers, set out to commandeer a machine that until then was seen as an electronic mastodon, suitable for corporate, military and scientific uses only. The digital revolution conquered the world of information and entertainment, transforming humanity. Likewise, but with even more ambition, Musk and his followers are trying to commandeer the energy, space and transportation industries. It is hard to imagine how these revolutions will transform life in the upcoming decades. What is certain is that Musk could become the adventurer who changes not only the world, but also another planet or two, and who could very well end his days buried under the red Martian soil. m.